WALLINGFORD - For many of the Berlin football players, it was a feeling that needed a little bit of time to sink in. There were so many things going on in the moment after Monday night’s Class M semifinal: cheers, joy, excitement and possibly even a little bit of relief. “It’s something you can’t really put into words,” quarterback Kevin Dunn said after his team’s 34-22 win over Sheehan. The loss for finding the right thing to say, to describe it, was understandable. It’s hard to imagine otherwise. It had taken four tries - really three due to the 2015 season - to reach this point. But here the Redcoats were, faced with a similar situation to the one they were in last year: only 48 minutes separated them from a championship game berth. The 2017 version of Berlin was blown out by Killingly 49-7. That team was inexperienced, overmatched and outplayed. Things got out of hand quickly and the Redcoats never recovered. In a way, it served as a necessary learning tool, albeit a painful one at the time. This version of the Redcoats (11-1) was ready, more than ready actually. The game was never as close as the final score would indicate. The offense operated with precision and efficiency, the defense caused havoc. Everything was finally coming together. While head coach Joe Aresimowicz and his players will say they could have played a lot better and believe their best game is yet to come when they take on No. 1 St. Joseph (11-1) for the Class M title on Saturday, there wasn’t much not to like about Monday’s performance. 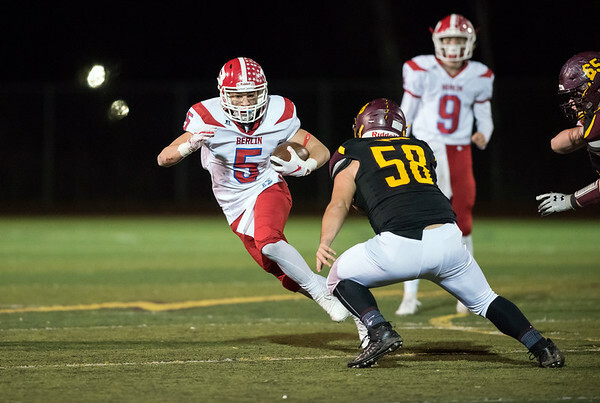 Take out the final two garbage-time runs, one of which went for 40 yards and the other for a 3-yard touchdown, from Terrence Bogan, and the Redcoats’ defense held the state’s leading rusher to 106 yards. He came into the game averaging 212.3 yards and three touchdowns a game. Dunn, meanwhile, threw four touchdown passes, ran for another and recovered a fumble on defense. Berlin had six different skill position players touch the ball at least once Monday night, three of whom finished with 65 yards or more of total offense: Alex Halkias (185), Zach Hrubiec (81) and Marco Scarano (65). The Titans looked lost and confused at various times in the matchup. That’s part of the reason why, a little over 12 hours later, the Redcoats were still enjoying the final moments of their win before their week of preparation began later Tuesday afternoon. Savor the moment every once in a while because they know what it’s like to be sitting at home instead. All that hard work, the ability to battle through tough situations had paid off to get them to within reach of their ultimate goal. Now, it’s all about embracing the challenge that lies ahead and it will be a challenge. The Cadets have faced seven teams this season with a .500 record or better, their only loss coming against nine-win Darien in Week 3. But there’s just 48 minutes - 68 if you include a long halftime - between Berlin and a desperately wanted state title plaque. And the Redcoats, especially this senior class, want that trophy. “It would mean the world,” senior linebacker Dominic Scarano said. “These seniors, we’ve been playing since the third grade together and now we’re at the end of the tunnel. We’re looking for a state championship. That’s what we’ve been thinking of since we started playing football and pretty much why we started playing football too. We came together when we were young. We always wanted a state championship and we have the talent and the support from our coaches to get there. If they show it on the field Saturday, there might be a few more speechless Berlin players. And they would be just fine with that. Posted in The Bristol Press, General Sports on Tuesday, 4 December 2018 21:09. Updated: Tuesday, 4 December 2018 21:13.